Isabelle is in eighth grade and at an age where she doesn’t want to be different from her peers, she just wants to make friends and feel normal. Once she starts her new school two girls, Margaret and Grace, befriend her but Isabelle has a hard time realising that these two girls really do like her. Yet even though this is a novel about a bereaved girl, it’s in no way a depressing, downbeat novel. Isabelle is like any other teenage girl – she gets up to mischief and has fun with her friends. It’s a coming of age novel, it’s about how life can throw the worst things at you and yet you can still find yourself laughing at funny things and being silly with your friends. Isabelle slowly begins to understand that life moves on and while she still feels sad that her dad isn’t there, she realises that there is still a lot of happiness to be found in the world and that she won’t die of a broken heart. This is a short novel but one to take your time reading, the subtly of the writing means so much of what is being said could easily be missed. This isn’t a fast-paced, action packed book, it’s a beautiful and moving account of one girl’s struggle to find a new normal. 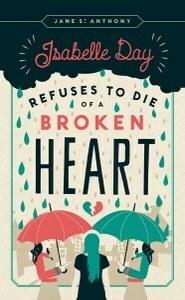 This book is for everyone but particularly good for a middle grade reader to help them understand grief and loss. It’s written in a way that doesn’t ever overwhelm, it’s a realistic but also very comforting read. It’s such a wonderful book though that whatever age you are, I highly recommend reading it. This entry was posted in Books, ebooks, Read 2015, Review and tagged Book Review, Books, ebooks, Fiction, Jane St. Anthony, Read 2015, Review, Young Adult. Bookmark the permalink.